My D Model is a long scale (28.5″ – 725 mm) guitar designed to be tuned one tone below standard. Fitting a capo to the second fret gives standard pitch at standard tuning and standard tension. Played open without a capo it has a magnificent depth of tone; played with a capo higher up it blossoms as a different guitar, bright and ringing. I build D versions of all my guitars; New World, Steinbeck, Martin Simpson model, and Model 2. 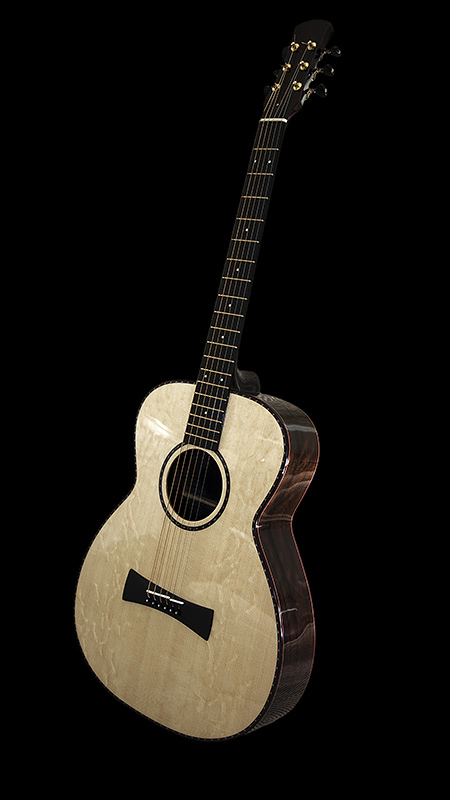 Back and sides can be of Malaysian or African Blackwood, soundboards of German or figured Sitka spruce. A few guitarists keep their guitars tuned permanently low, sometimes a semitone below concert pitch, sometimes a full tone. But tuning low on a standard scale has limitations, so in 2004 I built a long scale guitar to tune a tone down from standard. In standard tuning the 1st and 6th strings drop from E to D – hence the name ‘D’ guitar. (It turned out to be another case of re-inventing the wheel; there were already D guitars in existence). 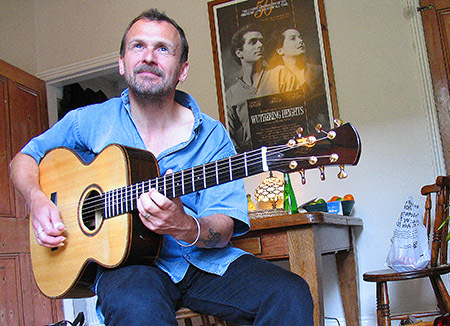 My first D guitar was built on a 12 fret version of my Model 1 guitar, and the next few built on 12 fret versions of Martin Simpson and New World models. 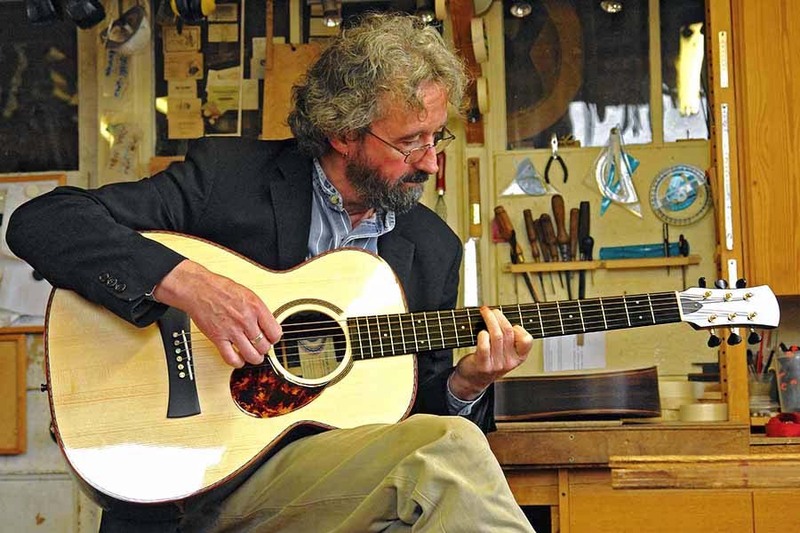 When Maurice Condie came to see me about having me build him a D guitar, he suggested I base it on my Model 2. 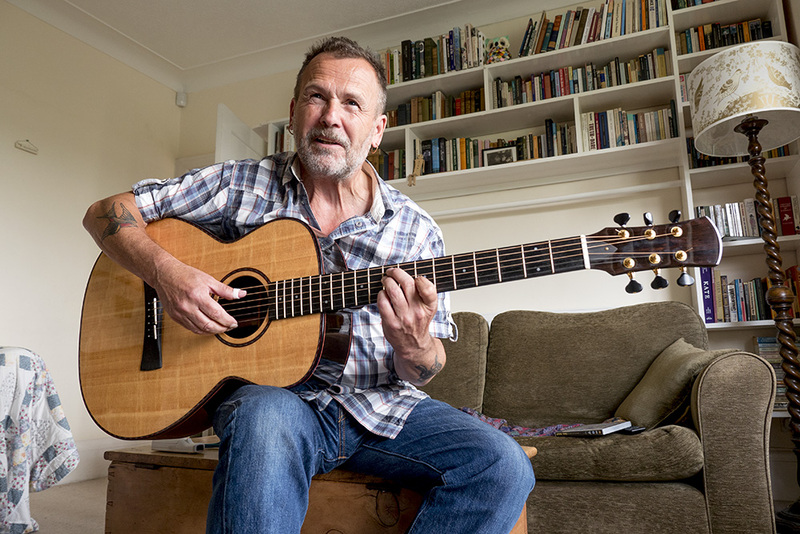 This has a longer body and was designed as a 12 fret, so needed no adaptation – this was a really good idea. Not only does it play a tone lower, whatever tuning and whatever body size is used, the D guitar has a wonderful deep resonant sound, a sound you just don’t get from a standard scale guitar.